As you probably know by now the Mets have issued the newly arriving Jay Bruce No. 19 and have allowed Jon Niese to take back the No. 49 he wore in his last go-round with the club. Bruce, who is scheduled to start in right field and bat third, will become the 36th guy to wear 19 for the Mets and has an outside shot of overtaking Roger Cedeno as the jersey’s most prolific home run hitter by the end of the year. (Roger had 18 dingers over three seasons as a Met 19). Also Tuesday, the Mets placed shortstop Asdrubal Cabrera (13) and outfielder Justin Ruggiano (1) on the disabled list, demoted bullpenner Seth Lugo (67) and recalled utilityman Ty Kelly (56) and reliever Josh Edgin (66). Edgin is making his first reappearance in a Mets jersey since September of 2014. I don’t normally keep track of this stuff, but it is notable the club is adding a combined 190 in combined uni numbers while subtracting just 90 — a net gain of 100 that has to rank as one of the largest one-day swings in club history. Here’s to more big swings from the new guys. 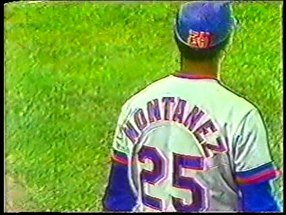 Only a matter of hours after posing the question MBTN readers came through with the definitive proof: Willie Montañez went tilde-less during 1979, as shown in this screen capture sent in by on-the-spot reader Paul C. Interestingly, this cap came from the same ’79 opening-day footage that Paul provided earlier to solve the Jesse Orosco 61 controversy: It’s also first day the Mets (except for young Orosco) ever wore their names above their numbers. That font by the way looks a lot chunkier than that which we’ve become accustomed to, and we needen’t get into the icky use of a separate nameplate. That’s a lot of mileage from a single game. Greg (you should read his blog) in the meantime confirmed Rory’s earlier contention that Alex Treviño in 1980 was the first Met to sport a tilde. Others, according to Rory: Roger Cedeño, Rey Ordoñez, Alejandro Peña, Edwin Nuñez and Fernando Viña. If the above interests you then by all means you should be reading the Uni Watch Blog, where recent discussion involves nameplates bearing the æ and ø characters. Final Update: Reports this morning say Mike Pelfrey 34 was in fact not recalled but is attending to a sore back in St. Lucie. Check the vector, Victor! The unhappy second chapter of the Roger Cedeno Story came to a predictable end on Saturday when the Mets “traded” the embattled right fielder to St. Louis for two guys who probably won’t make the team, catcher Chris Widger and reserve infielder Wilson Delgado. The Mets also kicked in almost all of Cedeno’s considerable salary. We wish No. 19 good luck in St. Louis; it wasn’t entirely his fault that the Mets overestimated his abilities, and we feel bad knowing that if fans made that distiction, it still sounded a lot like “Boo!” The upshot seems to bode well regarding a potential trade for Cleveland outfielder Milton Bradley; at the very least it may give Eric Valent a shot to be the lefty pinch-hitter they’ll need in Roger’s absense. Stay tuned! The offseason’s going out like a lion. The Mets Thursday signed X-Met Roger Cedeno to a four-year contract, creating not only a logjam in the outfield but a potential controversy over No. 19. That jersey currently belongs to Lenny Harris,himself as two time Met. Harris occupied No. 19 before Cedeno (1998) and after him (2000-present). On Friday, the Mets traded David Justice to Oakland for Mark Guthrie — who wore No. 19 with the A’s! We’ll keep you updated on this breaking controversy. Also on Thursday, the Mets created another possible conflict by signing David Weathers to a contract. The ex-Cub, ex-Yankee and ex-Brewer is most often seen wearing No. 49, digits currently belonging to Armando Benitez.